Ramps, also known as wild garlic, are a special treat for foragers. Every May, Rampdaddy and Rampmama gather together a group of amateur and professional foodies for a Rampfest. Guests are invited to bring a dish featuring ramps. 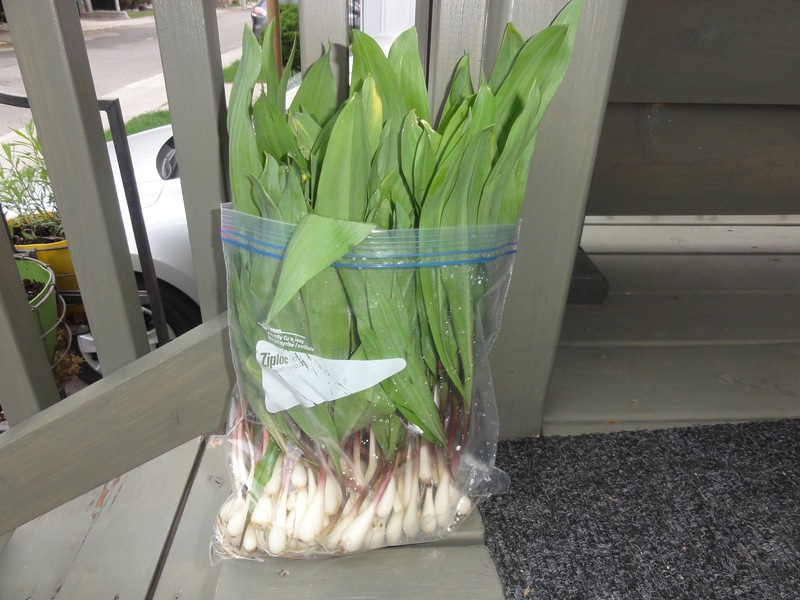 Recognizing that most people don’t have ramps lying around the house, the hosts have a bucket of clean ramps on hand for people to add to their dishes. 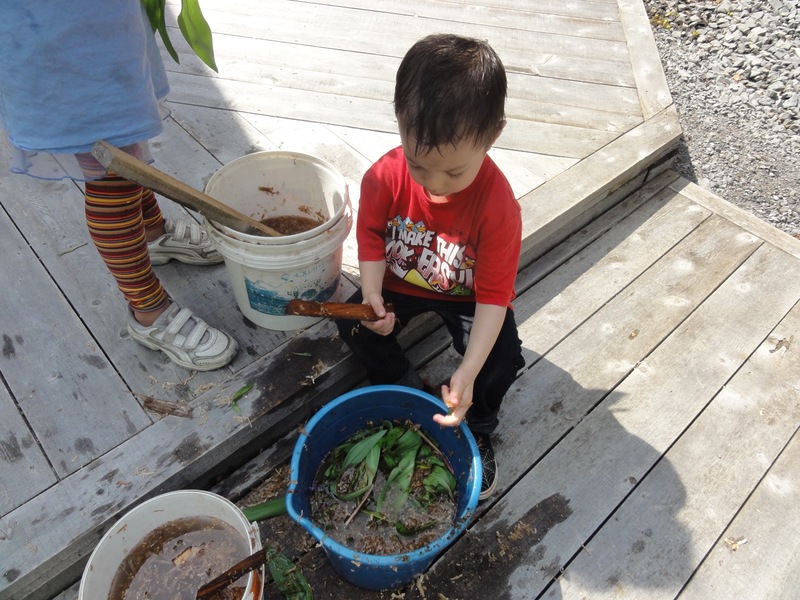 The early afternoon is spent sampling, chatting, walking, picking ramps. With possibly a bit of drinking thrown in. This year we brought Rampamole and Chips to the party. I lucked out with perfectly ripe avocados that made for a lush dip. The hosts grill a huge hunk of ramp-marinated meat and serve it with buns, potato salad and cole slaw. Delicious. Groaning that we can’t eat another bite, we always make room for the desserts and the cheese platter. 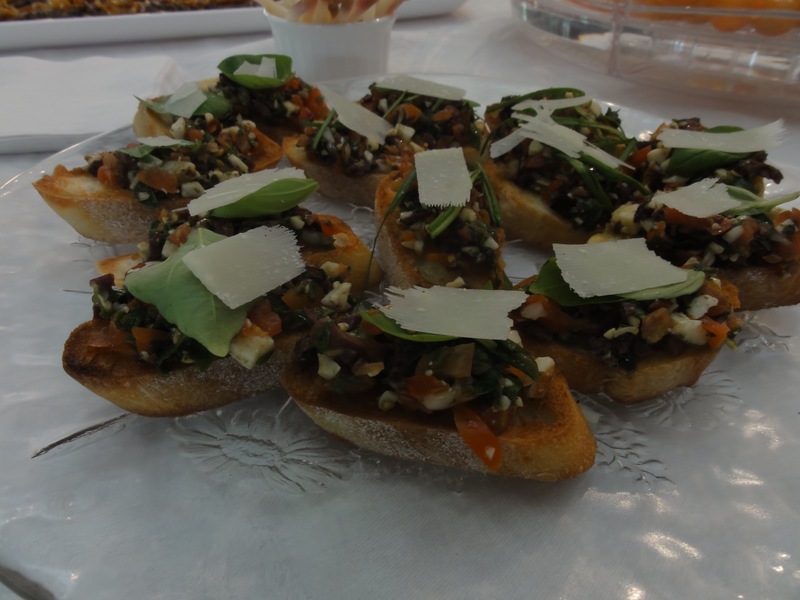 Rampmama serves her famous ramp jelly, a perfect accompaniment to blue cheese! Ramps are all well and good but it is the friendship that is the real forest treasure. This disparate group of people share a love of cooking and eating that transcends education level, income, age, birth country, house size, political leanings and pretty much all else. Paris is especially fond of Rampfest and several years ago, Rampdaddy and Rampmama encouraged her to sell the ramps she had picked. Generosity incarnate, they struck a deal with Paris that she could pick on their property and sell to any chef that was not already a client of theirs. The first two years she went door to door selling ramps in our neighbourhood. Most people had never seen or heard of a ramp before. You could say that she created a market for ramps where none before existed. Hearing her talk about folding thinly sliced ramp leaves into an omelette would make you buy up the lot right then and there. She didn’t use the word chiffonade but she didn’t have to. She smiled her radiant tween smile and proselytized about adding ramps to a tossed salad. She transformed those ramps into cold hard cash every time. This year she called a chef friend and he drove over and bought the 2 pounds that she and a friend had picked. At $15/pound, it was a delightful experience for a pre-teen. She’ll be back picking tomorrow to try to earn a little more moolah before the fleeting ramp-season is over. If you can get your hands on a handful of ramps, follow Paris’ advice and enjoy a salad, an omelette, maybe a garlicky marinade. If you find yourself with more ramps than you care to eat at the moment, why not try one of these two recipes? Please remember to harvest in a way that will ensure that ramps are available for our children’s children and avoid buying ramps from anyone who doesn’t think this is important. Combine 1 Tbsp Korean chili powder, 1 Tbsp kosher salt, 1 tsp sugar, 1 Tbsp toasted sesame seeds in a small bowl. 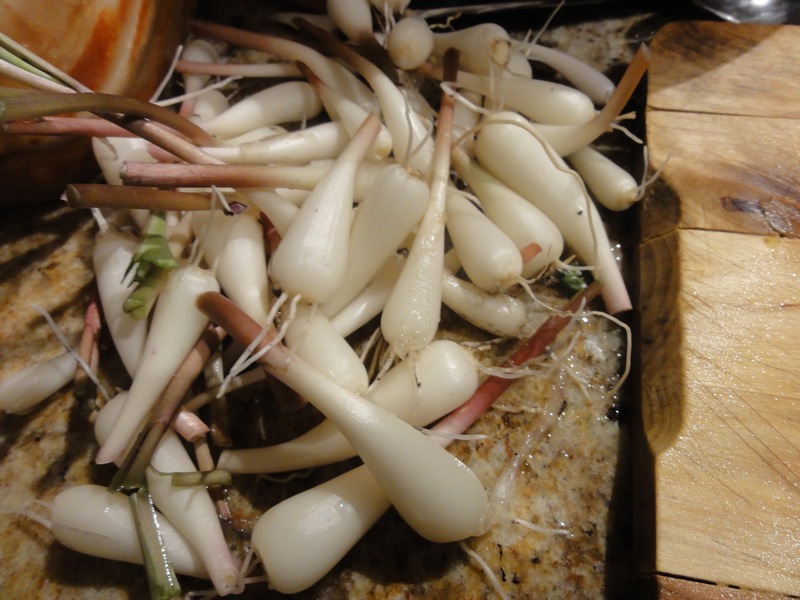 In a very large bowl, place 1 lb of washed ramps (leaves and bulbs). Make a slurry of 1/4 cup of water, 1 Tbsp of fish sauce and 2 tsp sesame oil. Massage the slurry into the ramps. Dump the dry mixture onto the ramps and massage with your hands to coat. You may want to wear gloves because the Korean chili will burn. Or just tough it out. 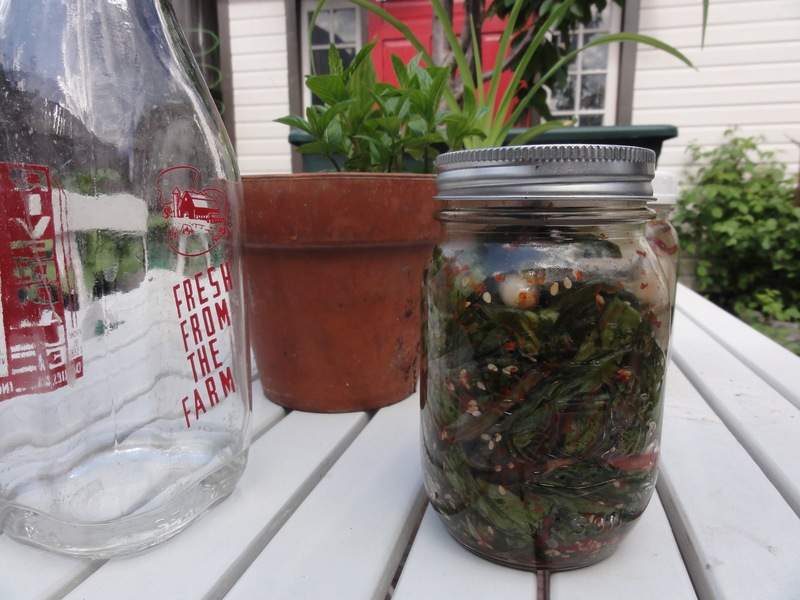 Pack the kim chi tightly into a mason jar with about an inch of space at the top and allow to ferment in the fridge for a week or two before eating. 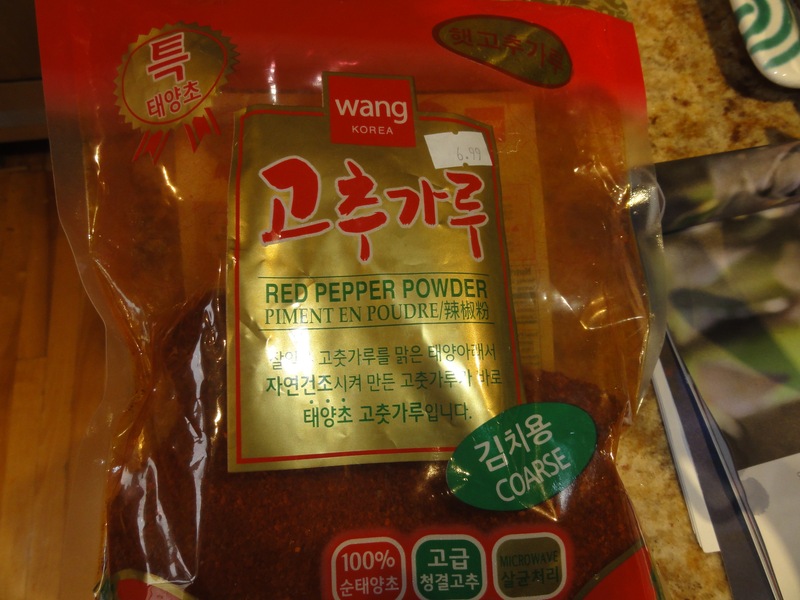 NOTE: Korean chili powder is a specific ingredient that can be found in Asian markets. Don’t substitute “ordinary” chili powder. Because Kim Chi is so popular in Korea and eaten with everything, you will find the bags of chili powder to be enormous. Get creative and start turning everything into kim chi. Cut the leaves off and reserve for another use (like those omelettes and salads). Slice the root end off the ramps and wash the bulbs well. 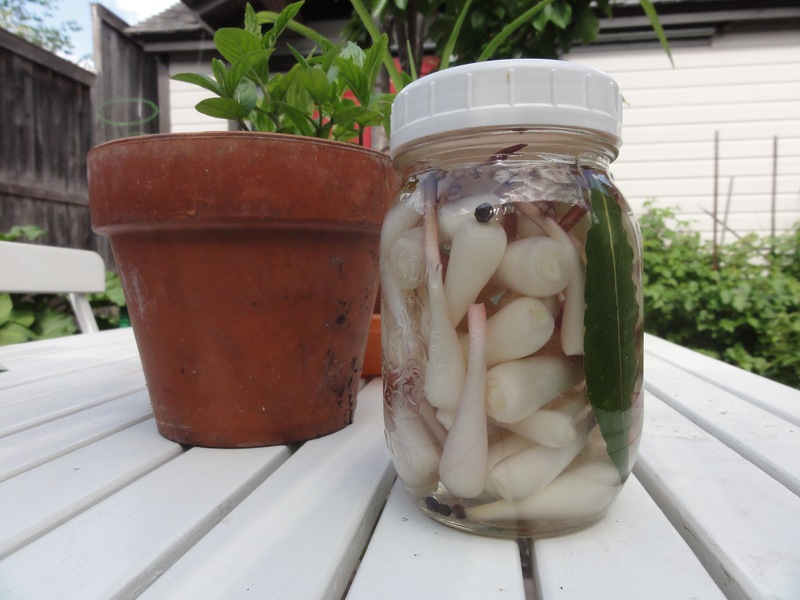 Pack a small mason jar tightly with the ramp bulbs. Slide a bay leaf in and throw in a few peppercorns and coriander seeds. Mix together 3/4 cup of water and 2-3 tsp kosher salt. Heat over low heat until the salt dissolves. Allow the mixture to cool. Add in 1/4 cup of white vinegar. Pour the vinegar mixture over the ramps in the jar. Cover and refrigerate for a day or two before eating. These pickles will keep for about 2 weeks in the fridge. Sounds so good and with avocado..it is so presentable..!! !